In remembrance of the terrorist attacks of September 11, 2001, Government Book Talk revisits blogger Michele Bartram’s post from September 11, 2013. About the author: Adapted by Trudy Hawkins, Writer and Marketing Specialist in GPO’s Publication & Information Sales Division in Washington, DC, from an original post by Michele Bartram, former Government Book Talk Editor in support of the U.S. Government Online Bookstore (http://bookstore.gpo.gov). Losing our Shared National Experience? Our blog post last week talked about GPO’s 150-year history of keeping America informed. But what does this mean in today’s media-saturated world? Has the proliferation of media eroded our shared national experience? [Figure 1. 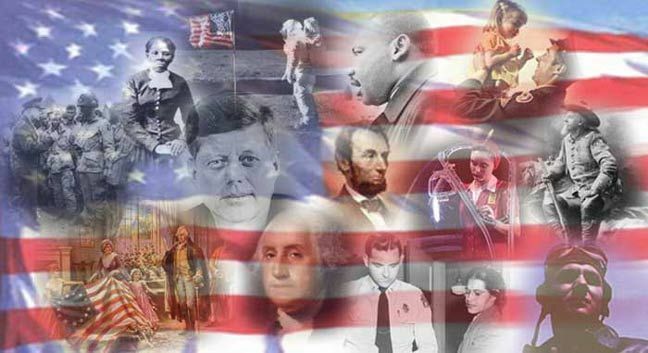 U.S. History Collage. Image courtesy of Mrs. Rice’s American History II class, Lexington High School, Lexington, Ohio. But even more surprising, he said that 50% of Americans today now get their news and analysis about important events— sometimes edited or changed as it is passed along— from friends and family, often via social networks, text or email rather than from traditional media sources. Prior to the 21st century, when Americans had only a few national media choices and limited local media, we would all receive the same original message at the same time, thus creating a shared American experience. Today, in the U.S. alone Americans can choose to receive information from any of an estimated 1,476 daily newspapers; 1,500 television stations; 10,322 radio stations; 71 million cable television subscribers with hundreds of TV channels each; and more than 12 billion web pages and social media. Kirkpatrick and others say the combination of the “Facebook effect”, media proliferation, and message selectivity have contributed to the erosion of our common, shared national experience. As we mentioned in our blog last week, GPO’s mission for over 150 years has been “Keeping America Informed” about the three branches of the Federal Government. This mission drives us to ensure the original information produced by Federal Agencies on behalf of the American people can be found by all Americans now and in the future. What’s involved in capturing and disseminating our common Governmental information? It starts with gathering the content from Federal Agencies and publishing it in a professional format, whether print or digital. It then continues with authenticating the information to ensure Americans are getting the “genuine” unaltered information; creating permanent records with our catalog teams for our own FDSys digital database and Catalog of Government Publications; distributing these records to libraries in our Federal Depository Library Program and to worldwide library databases like WorldCat; and sending physical copies and/or ebooks to libraries, bookstores and book etailers. View this video for an inside look at how GPO assembles and prints the Congressional Record—the official record of the proceedings, debates, and activities of Congress. To keep America informed digitally, we allow users to subscribe to email newsletters by topic and are also now on social media, including Facebook, Twitter, YouTube, Foursquare and Yelp. Here are some of my favorite Federal publications GPO has published that document significant shared American experiences over the past century. Do you remember when and how you learned of these events? What are some of the significant national experiences that you will never forget and how did you learn about them and share them with others? About the Author: Michele Bartram is Promotions Manager for GPO’s Publication and Information Sales Division and is responsible for marketing the US Government Online Bookstore (Bookstore.gpo.gov) and promoting Federal government content to the public.